High Voltage Transformer is designed to provide a short-time or continuous high ac Voltage. The frequency is normally 50 or 60Hz, but can be higher in special cases. A typical feature is that the excitation of the low voltage winding (excitation winding) is continuously variable up to the required value and right up to the rated voltage of the test transformer. A further feature of a test transformer is that it is able to withstand short-circuit conditions over an arc on a great number of occasions. The time period in which a test transformer is excited is normally short. It often amounts to one minute, sometimes up to 15 minutes. 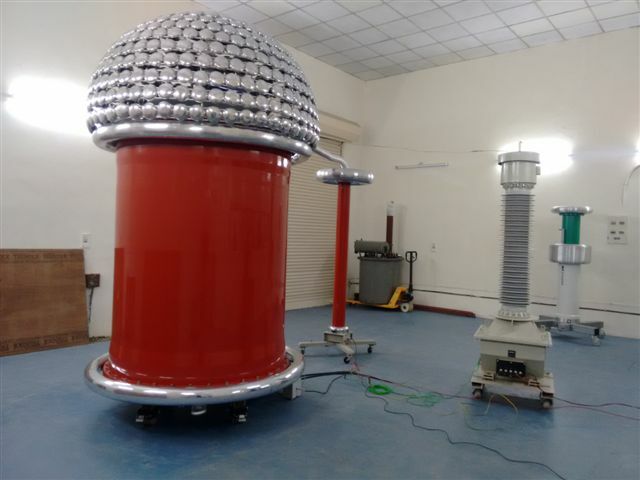 The oil cooled test transformers manufactured by WSTS in modular design are specified with two output power ratings one for continuous duty and the other for short time duty. Wide range of transformer ratings is available ranging from 100kV, 5kVA to 500kV, 500kVA. Partial discharge levels between <2 pC to 10pC up to rated voltage. Since the load connected to a test transformer is mostly capacitive, the possibility of compensation with additional reactors, mostly variable, should be considered. Such reactors are important in cascade circuits where they can be installed in the each stage and excited by the coupling windings.